Former Seton Hall basketball star and alumnus Jerry Walker was initiated as an honorary member of Phi Kappa Theta National Fraternity on Saturday, April 4. A solemn ritual ceremony was held in St. Joseph’s Chapel in Boland Hall on the Seton Hall campus at 4:30 p.m. Afterwards, nearly 50 Phi Kappa Theta undergraduate and alumni members and friends attended an initiation banquet at Cryan’s Beef & Ale House. In becoming an honorary brother, Jerry agreed to assume all of the obligations and privileges of membership in Phi Kappa Theta, a national collegiate fraternity with 50 undergraduate chapters and 48 alumni chapters throughout the country. It was founded as the first Catholic fraternity at Brown University in 1889. 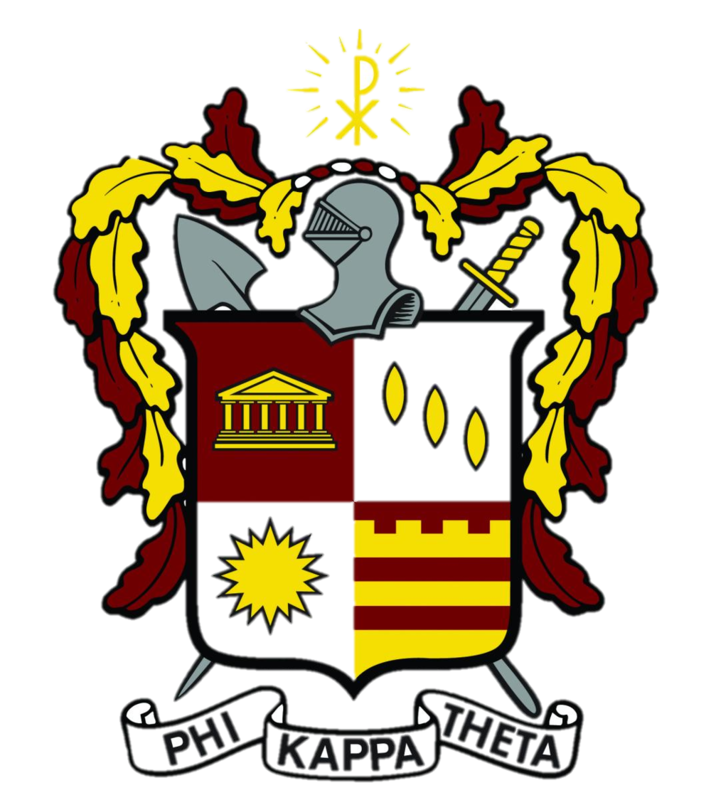 NJ Phi Beta Chapter of Phi Kappa Theta was chartered on April 28, 1962 and currently has 18 members. It was the first national fraternity to be approved by Seton Hall. 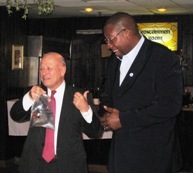 Jerry also is now a member of The Phi Kappa Theta Alumni Association of Seton Hall, an official SHU alumni club. It was formed on July 7, 1962 as an incorporated non-profit, tax-exempt organization and now has nearly 1,000 members. Nicholas R. Scalera ’63, a charter member of the chapter and foundation board member, welcomed attendees and introduced Walker. Scalera cited the important role Jerry Walker has played in advancing Seton Hall’s basketball program and for his important work with at-risk youths in his hometown of Jersey City. Walker led the Pirates to two Big East titles and three NCAA Tournaments in the 1990s. For his efforts, he was honored as Metropolitan Player of the Year and ESPN Post-Player of the Year and named to the Second Team All Big East Team. Jerry played professional basketball in Europe before returning to the university to earn his bachelor’s degree. In 1996, Jerry and his brother, Jasper, started Team Walker to offer inner-city kids the same opportunities they had while growing up in Jersey City. Jerry attributes his success in basketball and his Seton Hall degree to the positive impact of the after-school programs he took part in as a youth. Team Walker now provides year-round academic and recreational after-school programs for more than 500 at-risk Jersey City youths. Bryan White, NJ Phi Beta Chapter President, recounted the chapter’s history and mission and announced that the chapter had voted to designate Team Walker, Inc. as its official charity. As a result, the chapter will give a donation to Team Walker each year and the brothers and pledges will volunteer to help the agency. Brandon Brewster, president of The Phi Kappa Theta Alumni Association of Seton Hall's Board of Directors, explained the history and mission of the Phi Kappa Theta alumni chapter. The Rev. Paul A. Holmes, an honorary member and chaplain of the undergraduate and alumni chapters of Phi Kappa Theta, gave the Invocation. Father Holmes is a Seton Hall Vice President and a member of the Board of Directors of The Setonian Foundation. After dinner, White presented Walker with a Phi Kappa Theta membership plaque, a beer mug and a manual describing the national fraternity’s history, traditions and membership requirements. Then, Brewster gave Jerry a $500 check as a donation from The Setonian Foundation to Team Walker, Inc., adding the foundation would continue to support Jerry’s work with inner-city youth in the years ahead. In his remarks, Walker expressed his appreciation for being initiated into Phi Kappa Theta and promised to be a loyal and faithful member. “I always wanted to join a fraternity as an undergraduate, but Coach PJ Carlesimo wouldn’t allow it. PJ told us the basketball team was our fraternity.” Walker also thanked the fraternity for its gifts. Luckily, Jerry’s wife Sharonda rescued the fish, noting their children would be thrilled to care for it. The Walkers have two daughters, Shannon, 12, and Rochelle, 14. The presentations concluded with Benediction delivered by Father Holmes. The brothers then raised their mugs in a stirring rendition of the Phi Kappa Theta Stein Song and the undergraduates gave the PKT Chant. Among the many other distinguished guests were: Matthew Borowick, SHU Associate Vice President of Alumni & Government Relations; former Pirate basketball standout Arturas Karnisovas, Director of Global Scouting and International Affairs for the Houston Rockets; Robin L. Cunningham, SHU Freshman Studies Mentor and former star of the women’s basketball team; Leo Zatta, partner of Wiss & Co. and chairperson of the Board of Trustees of Team Walker, Inc.; and Dr. Peter G. Ahr, Associate Professor of Religious Studies and Director of the University Honors Program.